Around 4,000 lives continue to be at risk since a landslide left a 200-feet-high wall of debris on the Phutkal river in Kargil on December 31, 2014. 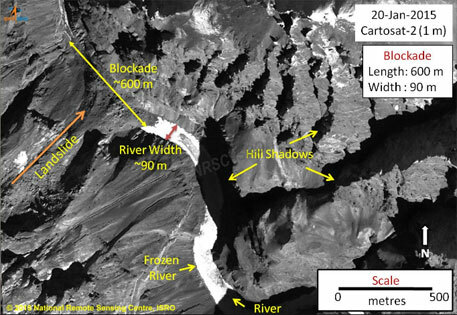 The mountain soil has blocked this tributary of the Zanskar river and created a 14-kilometre-long lake, according to the latest images released by ISRO’s National Remote Sensing Centre. Fearing a breach in the wall of debris, local administration officials have issued warnings to people living in 29 villages downstream in the Zanskar valley. On February 8, more than a month after the incident, a team of National Disaster Management Authority officials will finally reach Ladakh. They will visit the blockade near Marshun village, about 90 kilometres from Padum, the Zanskar sub-divisional headquarters. Ladakh Deputy Commissioner Jamyang Namgial has issued prohibitory orders to trekkers, asking them not to venture on the famous “Chaddar trek” in the region. Helicopters are on stand by and control rooms have been set up to evacuate stranded persons. The Indian army and air force are helping with these measures. While Ladakh MP Thupstan Chhewang had sent an alert to Union Home Minister Rajnath Singh on January 31 seeking his intervention, Zanskar MLA Syed Muhammad Baqir Rizvi lamented over the slow response of the Union government. Leh officials told Greater Kashmir, a local newspaper in Srinagar, that the blockade is also a threat to the Nimo Bazgo hydroelectric power project of National Hydroelectric Power Corporation. They fear that the frozen water in the newly created lake may start melting. Officials said that the debris has been blocking 97 per cent of the flow of around 1,415 litres of water per second. Sphere India, a coalition of relief agencies working in disaster-prone areas, said in its release that blasting the barrier will not help. It explained that the valley is narrow and blasting would only lead to more accumulation of debris, further blocking the river. In August 2010, flashfloods triggered by a “cloudburst” in Leh had caused massive damage to life and property. In September 2014, Jammu and Kashmir also witnessed large-scale destruction due to floods triggered by incessant rains. Breaches in such walls of debris have caused floods in different regions across the Himalayas. In January 2010, a debris dam burst in Attabad in the Baltistan region of northern Pakistan, killing 19 and displacing 25,000 people. In August 2014, another landslide dam on the Sunkoshi river in northern Nepal burst and killed 123 persons on the Nepal-Tibet trade route.